Greetings on this 61st Independence Day of India and a tribute to one of her most endearing freedom fighters - Shaheed Bhagat Singh. The movie starring Ajay Devgan was a critical success but a commercial failure that is definitely worth a viewing. 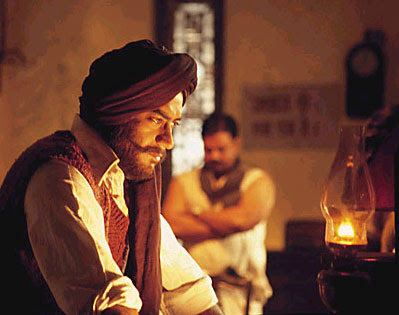 It won the critics choice at the Filmfare Awards and Devgan nabbed the prestigious National Award for his portrayal of the legendary freedom fighter. 'The Legend of Bhagat Singh' is one of those rare movies that manages to simultaneously entertain as well as inform and does so with a minimal amount of rewriting history in doing so. I really enjoyed this movie as the attention to detail is amazing and being a huge fan of period pieces, it was especially a treat for me. The majority of the movie takes place in Lahore, Punjab (now in Pakistan) which is fondly remembered throughout the movie in both name and image. It was a sobering reminder that although independence was a joyous event it also resulted in the partition of India, the aftermath of which is still felt to this day. The true story of Bhagat Singh is even more amazing than the one on celluloid - not an easy feat in the glamorous make believe world of Bollywood. He was 13 when he began to follow the teachings of Mahatma Gandhi and began to take part in protest marches as well as the burning of British schoolbooks. However he grew disillusioned with Gandhi's non-violent movement and became involved with a group who was linked with bombings of government buildings and the murders of some prominent pro-British politicians. His legendary fast for 63 days while in Lahore Central Jail for inhumane treatment of Indian political prisoners endeared him to the public and drew the praise of both Gandhi and Mohammed Jinnah (the founder of Pakistan). He was finally sentenced to death for his role in the bombing of the legislative assembly and his execution was set for March 24, 1931. However due to the overwhelming public opposition to the ruling, an emergency decision was made to hang him one day earlier to avoid a public spectacle. 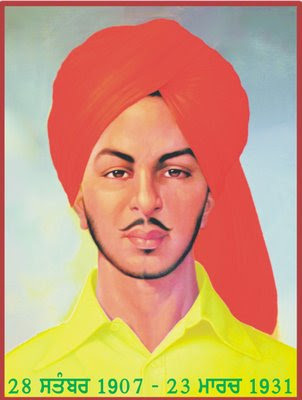 The bodies of Bhagat Singh and two other freedom fighters were cremated unceremoniously before his relatives (who were not allowed to visit him in jail) could perform the last rites. 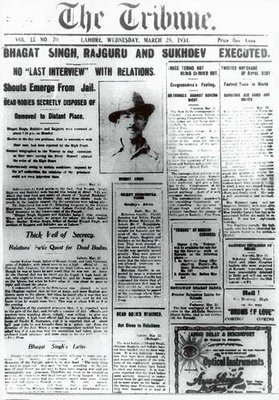 By all accounts he was fearless even on the day of his death and kissed the noose before the rope dropped - Shaheed Bhagat Singh was just 23.
mix of songs. However there is one that stood out for me long after the movie ended and I am not sure if it was because it was such an amazing song or whether it's picturisation made it so memorable. It is the grand and sweeping Mujhe Rang De Basanti by Sonu Nigam and Manmohan Waris that plays while the three men are led to the gallows. It literally means 'color me saffron' with saffron (yellow) symbolizing joy, happiness, intellect and ultimately - sacrifice. Absolutely my fav freedom fighter ever (along with chandra Shekhar Azad)- and I really think ajay did an amazing job portraying him. It was v interesting that 3-4 Bhagat Singh movies came out that year- but was the strongest version I my opinion. Happy Independence Day (albeit belated), Sanket! It took every one of them, didn't it? What did you think of the portrayals of Bhagat Singh and Azad in the movie Rang De Basanti (2006)? PS: Adding you to my blog roll. Hope it's okay. Until next time. I remember watching the older Bhagat Singh movie as a kid - Shaheed (1965) - which had Manoj Kumar playing Bhagat Singh and remember the nightmares the prison torture scenes gave me! Never did get round to watching the newer ones - its too painful to watch the sacrifices made by our freedom-fighters and then see what use we have made of our precious freedom! TBF - Same to you and yes, it took every last one of them to help get India to where it is today. I was vascillating between this movie and 'Rang De Basanti' as the review for Independence Day but stuck with this one. I thought the portrayals were excellent all around and that giving them a modern day face helped me realize how much they are still relevant today. BV - I just read about 'Shaheed' the other day as one of the top 10 Independence movies in Bollywood history and just ordered it. Luckily I grew up on a steady diet of masala movies and did not watch too much heavy stuff as a kid. I agree completely with what about the sacrifices - I try and watch these kind of movies not only for entertainment but also so I can appreciate what I have today as well. p.s. TBF - thanks for adding me and have done the same for you as well.